New: Added “Preview” (individual web font) link next to the Web Font select box. My WebFont of the Day Tip : “Cherry Swash”. New: Facebook is now adding prompts beneath your status box asking you to update your status about certain current events (such as Election debates etc) or public holidays or festivals, if you tick the “Hide Nagging Questions” option under “Timeline Options“, FBP should hide these now. 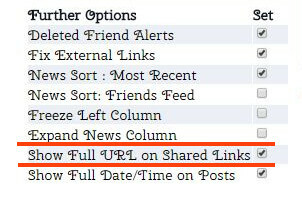 Fixed: Fixed “Expand News Column” option. Previously it was set to auto-expand, and would change widths as you scrolled the page down, the width should remain stable now. Fixed: Stopped the FBP News notification from showing up on every install, it should now only show up if there is a new story on the FBP fan page. Fixed: Renamed Hide “Wrote on Wall” option to Hide “Wrote on Timeline” to make it clearer to new users what the option does. If you have the expand news column option turned on and chat/sidebar hidden, then open the chat/sidebar, the chat column will open up slightly overlapping the news column. A page reload will fix this issue. The font preview box sometimes appears in random parts of the screen if the existing font size is too large. I’m looking into fixing this. The WebFonts option works really badly on Firefox, if you set a webfont in Firefox, the screen will flicker a lot. It works fine in Chrome however, in case you want to try it. It also works ok in the developer version of Firefox (FF47) so when the fixes in that version of Firefox trickle down to the stable version of FF, the web fonts option should start working ok, or you could switch to using the Developer Version of FF, though you would currently need to use the Greasemonkey extension with the GM script version of FBP for that. Tip for Google Chrome users who are having problems updating FBP: Tick the “Developer Options” box button on the Extension management page, then click “Update Extensions Now” button. Please note this won’t work if your version of FBP says “Not From Chrome Webstore” next to it due to a bug in chrome. If it says that, you need to either update it manually via the instructions on the FBP install page, or else export your FBP settings (see user guide on how to do this) then uninstall FBP, then reinstall it via the green “Install FB Purity” button, then import your FBP settings you exported previously. After doing that FBP should be able to auto-update in future. For those who don’t already know, FB Purity is a safe, free and top rated web browser extension for Google Chrome, Firefox, Safari, Opera and Maxthon. It lets you clean up the junk and customize Facebook the way you want it to be. It has many cool features, such as hiding all the ads, alerting you when friends un-friend you, letting you change the site’s colours, fonts and background image, let you stay on the “Most Recent” feed permanently and lots more. FBP has been reviewed and highly recommended in none other than the Washington Post! This entry was posted in Facebook, FB Purity and tagged block facebook ads, change facebook font, change facebooks fonts, clean up facebook, customise facebook, Customize Facebook, Facebook, FB, FB Purity, FB Purity Update, FBP, FBP Update, fluff busting purity, hide facebook ads, hide facebook emoticons, hide facebook smileys, hide sponsored posts, hide sponsored stories, newsfeed filtering, remove facebook ads, web fonts, webfont, webfonts, webfonts on facebook. Bookmark the permalink. Hi the new one is giving a 404 error, so now I can not get the last one 14.3.1 is there way I can get that back until you fix the problem with this new version please. sorry, its fixed now. clear your browser cache.